During my experience as the caregiver to the most badass cancer warrior dog in the world, my beloved Nola, I realized that cancer is so much easier to prevent, than it is to fight. I only wish that I would have known, when she was younger, about all of the wonderful herbs and spices that build the immune system and prevent and fight cancer. I am completely perplexed by how little nutrition is taught or utilized in western medicine for the treatment of cancer, arthritis or any other disease. Let me simplify how cancer works in the body and explain why the following ingredients will help to turn the body into a cancer killing environment. The following is true for both humans and canines because cancer is cancer. Cancer thrives in an acidic environment and it feeds off of sugar. Conversely, omega-3 starves cancer by oxygenating the blood and cancer cannot thrive or survive in an oxygenated, alkaline environment. This information is a game-changer in your fight against cancer – knowledge is your secret weapon to controlling the disease. To be clear, I’m not claiming that this is the next miracle cure for cancer and that it’s the answer to everything, but it is basic chemistry that can’t be disputed. There is scientific evidence that proves that cancer can’t survive in an oxygenated, alkaline environment, so doesn’t it just make sense to do everything possible to create an oxygenated, alkaline environment in your dog’s body, as well as your own? As a senior dog, Nola’s body was showing many signs of an auto-immune disorder, but her symptoms were all diagnosed as “allergies” and treated with antibiotics, Benadryl and steroids, all of which are detrimental to an already compromised immune system. As soon as I started enhancing her food with the following wonderful ingredients, after the cancer diagnosis, her rash cleared up almost over-night, her coat turned very thick and shiny and her dandruff went away – again, AFTER she got cancer her health actually improved with proper nutrition. I later learned that these were all symptoms of auto-immune disease in dogs, and we were treating her immune deficiencies with antibiotics and steroids! Learning this made me feel angry, ignorant, and mad at myself for not doing my own research earlier. I put all of my trust in someone else to tell me what was best for my dog. MY dog, MY responsibility. Once she got cancer, I started researching like a mad woman, literally spending hundreds of hours reading everything I could find on natural cancer cures. Very early on, I had an epiphany that is so simple and so under-estimated by our mainstream health care system. We should have been treating the cause of the symptoms instead of the symptoms themselves. I can promise you that I will never make that mistake again, which is why I now add the following power ingredients to my healthy dogs’ food, as well as my own food, to help prevent cancer and arthritis and keep us healthy as we all age. Yes, these are all great remedies for arthritis too, because arthritis works the exact same way in the body as cancer and is caused from inflammation and an acidic PH, just like cancer. Let’s go ahead and address the white elephant in the room – you know, the fact that garlic shows up on the “unsafe food for dogs” list every time, but yet I am telling you to feed it to your dogs. The reason why it shows up on the list is because garlic and onions contain thiosulphate, which is the substance that causes ‘Heinx Factor’ anemia in dogs and cats; therefore, they get grouped together as unsafe food for dogs and cats. But onions have a much higher amount of thiosulphate than garlic, which has almost untraceable amounts when given properly, and therefore should not be compared to an onion with regard to toxicity for canines. Cats, however, are much more sensitive to thiosulphate and should NOT have garlic or onions. For dogs, garlic is a powerhouse of immune building, cancer fighting properties, wrapped up in a tiny little bulb and it is included into every canine cancer fighting diet that I have found in my research. I had planned to eventually write an entire blog on the importance of garlic for dogs, but then I found this blog on the same topic, by Ottawa Valley Dog Whisperer. Her information on garlic is so comprehensive and well written, stating every single point that I wanted to drive home to you, that I decided to just share hers and save myself the trouble. The main properties that make garlic a force to be reckoned with, when fighting cancer and arthritis, is it’s powerful anti-inflammatory and alkalinity properties, both imperative in the fight against cancer and arthritis. To fight cancer, I gave Nola, who was 80lbs, (1) clove with every meal – up to (3) cloves per day. To prevent cancer, you can cut that amount way back. I currently give my healthy dogs, who are medium size (30 – 45 lbs), (1/2) of a large clove or (1) small clove each, (which is approximately the equivalent to a teaspoon when finely chopped) a few times a week, to boost their immune systems and keep their bodies alkaline. During the spring and summer, I increase it to a daily dose to help repel fleas & ticks as well as boost the immune system to fight spring allergies. My dogs tend to get a runny nose at the peak allergy season, just like I do, and one dose of garlic clears it up for them. Garlic is also a great natural antibiotic and it helps little cuts and scrapes heal faster. My last thought to leave you with about the importance of garlic is this. Remember when I mentioned that Nola’s rash cleared up almost overnight once I enhanced her diet? Well, when I was tracking her food charts to see what I had done differently in the last few days that might have helped, garlic was the only thing different that I had added at that time, once I decided that it was safe. I was immediately convinced that not only is it safe, it is powerful. Before pealing or chopping your garlic, always crush it first with the side of your knife. Not only does this make it easier to peal, it also unleashes the powerful essential oils that make all the magic happen in the body. This is what I would consider a large garlic clove, crushed, pealed and ready to chop. Once chopped, it equals approximately (2) teaspoons, which I split between my two medium sized dogs. Like garlic, ginger is also an amazing anti-inflammatory and promotes alkalinity in the body. A little ginger goes a long way and a small amount (1 tsp of fresh ginger, which is approximately 1/2” peeled and finely chopped) should be in every single meal. These images illustrate the amount that I split between my two medium sized dogs per meal. This is a teaspoon represented in the photos. Phytochemicals found in turmeric have been researched for their potential effects on cancer and other diseases. Turmeric has long been used as a powerful anti-inflammatory in both the Chinese and Indian systems of medicine. Always use turmeric in conjunction with fresh ground black pepper because the pepper increases the efficacy (absorption into the body) of the turmeric. 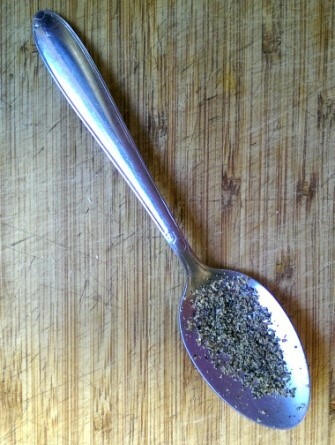 I highly recommend adding a teaspoon into every meal with several dashes of black pepper – I can’t say enough about the importance of this spice for a complete cancer fighting diet. Shown here is the approximate amount of fresh ground black pepper (right) I use along with a teaspoon of Turmeric (left). This is about 8 to 10 cranks on the pepper mill. Promotes Alkalinity – Remember that cancer cannot survive in an Alkaline Body – ACV is nature’s anti-inflammatory. Raw (unfiltered) organic ACV, like Braggs, has the “mother” which is full of enzymes and healthy bacteria that most believe is responsible for the health benefits of ACV. You can tell that it has the “mother” if it is cloudy with bits floating around in it – be sure to shake well before pouring so that you get some of the healthy bits into your food. If you use Braggs, then you will know that you are getting true, raw Apple Cider Vinegar, which is high in anti-oxidants and immune system support. To feed to your pets, mix (1) or (2) tablespoons right into their food or mix with (1) tsp of raw organic honey and bee pollen in a small amount of warm water. You can utilize a food syringe to help your dog drink the water if they aren’t willing on their own. If your dog is experiencing swollen lymph nodes due to the cancer or other infections, ACV works very well to clean out swollen lymph nodes too. We experienced this with Nola one night after her amputation surgery, due to an infection that she had acquired, and the ACV worked within minutes. To use yourself, you can throw it in a salad or put a tablespoon in a glass of water in lieu of lemon every once in a while. By combining generous amounts of organic, unrefined coconut oil with necessary amounts of omega-3 (see Fish Oil below), we are basically supporting and following the guidelines of a Ketogenic Diet, without the fasting, which has been used to starve cancer cells for years. For a cancer dog, I highly recommend that you start your dog on (3) Tbs of organic, unrefined coconut oil (any size dog) throughout the day, every day, and even more if they like it and want it, within reason. Coconut oil is one of those super foods that is simply healthy and you can’t over dose. It can, however, give them a full feeling, since it saturates the liver on the way to the digestive tract, which might make it hard to feed them the necessary cancer fighting meals. I waited until after Nola ate or mixed it directly into her food. I give my healthy dogs (1) Tbs a day mixed into their food for healthy immune support. Sometimes I use it as a healthy treat by lightly blending (1) Tbs coconut oil with (1) Tsp raw organic honey, which I call my Cochoneynut treat, and always make myself a serving as well. This is what the Cochoneynut treat should look like once blended. Fish oil is a great sources of omega-3 for dogs and vital in oxygenating the blood to starve cancer cells. For my healthy dogs, I give them each (1) 1000mg Fish Oil pill daily – broken open and squeezed onto their food. Fish oil will maintain a healthy coat and promote heart health as well. When using it to treat cancer, I started Nola (80 lb dog) on (4) 1000mg pills a day and later learned that the recommended dosage is 1000mg for every 10 lbs, so I doubled her dosage to 8-10 1000 mg pills a day. Toward the end of our journey, I had a conversation with a gentleman who was doing extensive research in the concept of the Ketogenic Diet, utilizing MCT and Omega 3, and he informed me that I could and should be giving Nola up to 20,000mg a day for an 80 lb dog, which is what we gave her toward the end of her protocol. I did get the approval from our vet, Dr. Baker, prior to doubling her dosage for the second time, and she explained that it takes very large doses of omega-3, when using it to oxygenate the blood for cancer treatment. Some dogs will get soft or runny stool if given too much and too quickly. If this happens, just back off to a smaller dose and try to slowly increase it over time, finding that sweet spot for your dog. We never had that issue with Nola and it might be because I increased it over time, but the increase wasn’t what I would call gradual, since I doubled the dose with each increase. She was on each dosage for a couple months before it was doubled. Her diet was packed with a lot of fiber from fruits and vegetables, which most likely helped to keep her from getting loose stool. If you have issues with diarrhea, as I mentioned in my previous blog on canned pumpkin, you can add a couple tablespoons of canned pumpkin to their food, which works like a charm to firm up soft stool. All of these ingredients are inexpensive and easy to find at your local grocery or health food store, and very little of each one will reap huge benefits to your overall health. This makes it so easy to include them into your meals as well as your pets’ on a daily basis, even when living on a budget. Don’t feel like you have to include every ingredient into every meal – mix it up and alternate them, so that you and your dogs are getting a variety of powerful cancer fighting sources on a daily basis.